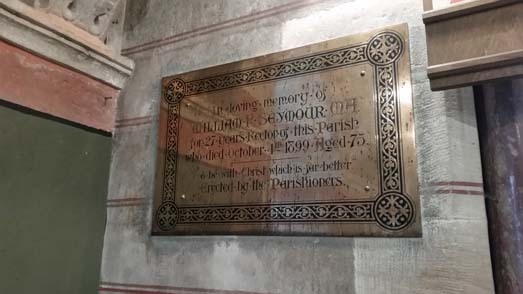 The following plaques are inserted into the internal walls of Abington Church (Church of Ireland), Murroe, Co. Limerick. This church was opened 7 November 1870 replacing an older church in the parish. Where possible obituaries from the Limerick Library Local Studies Collection have been linked. To the beloved memory of George Frend M.A.M.D. Who died July 20th 1887 aged 26 years. And this is his commandment that we should believe in the name of his son Jesus Christ and love one another as he gave us commandment. This tablet was erected by his mother brothers & sisters. 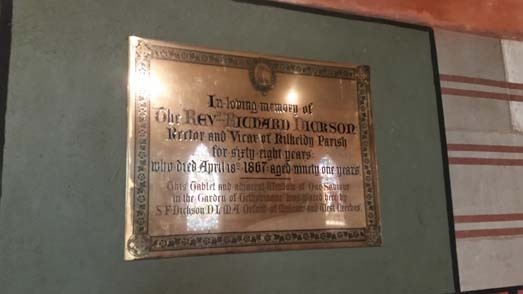 In loving memory of The Rev Richard Dickson rector and victor of Kilkeldy parish for sixty eight years who died April 18 1867 aged nintey one years. This tablet and adjacent window of Our Saviour in the garden of Gethsemane was place here by S.F. Dickson D.L.M.A. Orford of Mulcair and West Creebes. 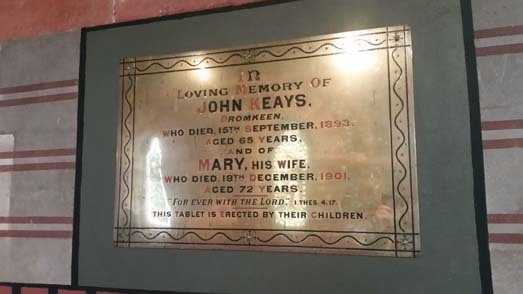 In loving memory of John Keays, Dromkeen, who died 15th September, 1893. Aged 65 years. And of Mary, his wife who died 18th December, 1901, Aged 72. “For ever with the Lord” I.THES 4:17. This tablet is erected by their children. 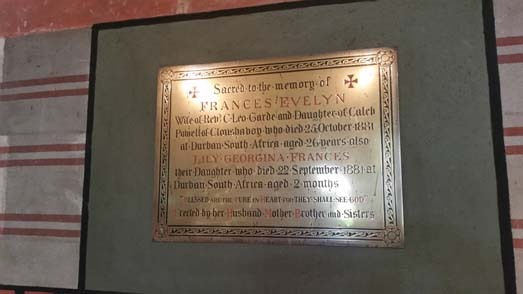 Sacred to the memory of Frances Evelyn wife of Rev C. Leo Garde and Daughter of Caleb Powell of Clonshaboy who died 25 October 1881 at Durban South Africa aged 26 years also Lily Georgina Frances their daughter who died 22 September 1881 at Durban South Africa aged 2 months. “Blessed are the pure of heart for they shall see God”. Erected by her husband, mother, brother and sisters. 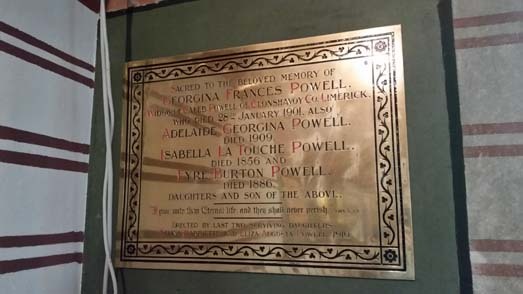 Sacred to the beloved memory of Georgina Frances Powell widow of Caleb Powell of Clonshavoy Co. Limerick who died 28th January 1901. Also Adelaide Georgina Powell died 1909. Isabella La Touche Powell died 1856. Eyre Burton Powell died 1886. Daughters and Son of the above. “I gave unto them eternal life and they shall never perish” John X 28. Erected by the last two surviving daughters Selina Harriette and Eliza August Powell 1910. 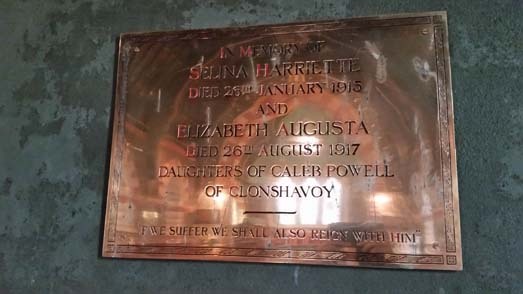 In memory of Selina Harriette died 26th January 1915 and Elizabeth Augusta died 26th August 1917 daughters of Caleb Powell of Clonshavoy. “If we suffer we shall also reign with him”. In memory of Henry William Davidson M.A. 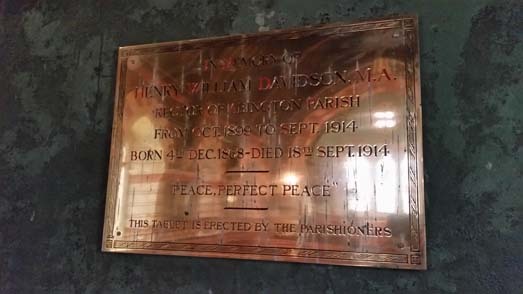 Rector of Abington Parish from Oct. 1899 to Sept. 1914 Born 4th Dec. 1868 – Died 18th Sept. 1914 “Peace Perfect Peace”. This tablet is erected by the parishioners. 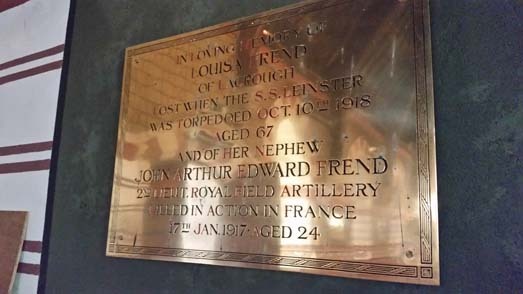 In loving memory of Louisa Frend of Lacrough lost when the S. S. Leinster was torpedoed Oct. 10th 1918 Aged 67 and of her nephew John Arthur Edward Frend 2nd Lieut. Royal Field Artillery killed in action in France 17th Jan 1917 aged 24. 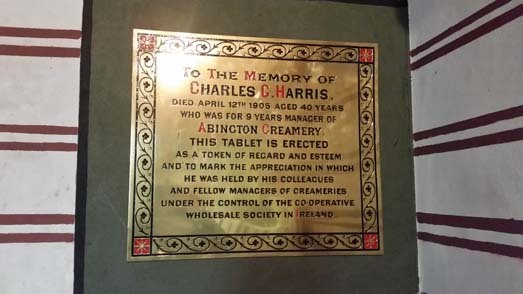 To the memory of Charles G. Harris died April 12th 1905, aged 40 years who was for 9 years manager of Abington Creamery. This tablet is erected as a token of regard and esteem and to mark the appreciation in which he was held by his colleagues and fellow managers of the creameries under the control of the co-operative wholesale society in Ireland. 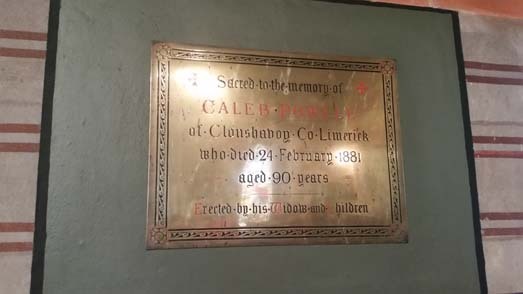 Sacred to the memory of Caleb Powell of Clonshaboy Co. Limerick who died 24 February 1881 aged 90 years. Erected by his widow and children. In loving memory of William P. Seymour M.A. 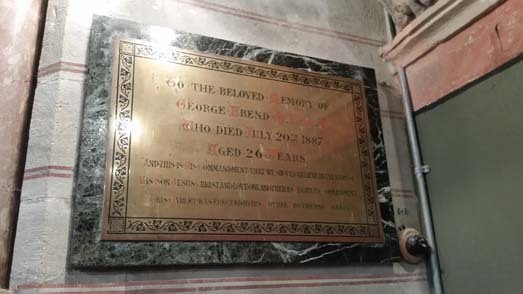 for 27 years Rector of this Parish who died October 4th 1899 aged 75. “o be with Christ which is far better” Erected by the Parishioners. 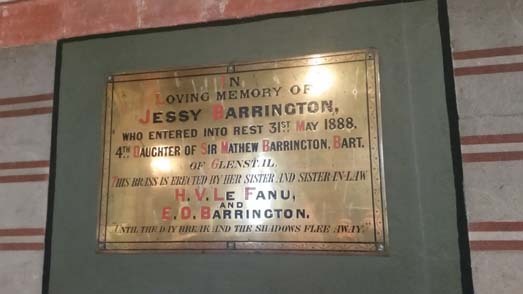 That was a great thought to show the plaques on the wall on the inside of Abbington Church very edudational as these are seldom open to read.